In our region, the climate is temperate but with enough variation to make it interesting. Although in the winter you might get only a light dusting of snow, we keep our main rental season between April and November when the best weather is most likely to occur. We've been to the village during every season and we have hit patches of rain and patches of cold and, last year, our first heat wave. But the overall sense of beauty and the pleasure of being there were not at all diminished. April-- we've had weeks of sunshine but also some steady rains-- usually a good smattering of each. 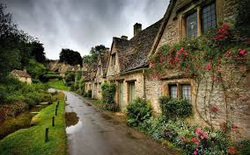 It's a beautiful time because the village is waking up, it's already starting to green up, there are flowers and the air is fresh and invigorating. You may have days you'll need just a t-shirt and light pants, but you'll want to bring warm sweaters and rain gear (a simple poncho and/or hat), and comfortable water-resistant walking shoes. Bring along a good portable umbrella too-- although the rain tends to be intermittent and more of a sprinkle usually, it sometimes gets heavy and steady. Click here for: a brief French history lesson that includes a list of things you can do when it rains. May-- you may have some of the residual rains and chills more common in April, but again it is another gorgeous month of Spring, usually with heavy doses of sun. Nights can get cool, but you'll find extra blankets in each bedroom armoire or bureau, and there are portable radiators in addition to the grand fireplace (please read the fireplace instructions in the 'operations manual'). June, July, August-- these are typical summer months-- lots of sunshine, occasional thunderstorms, spectacular skies, and seldom the need for a sweater except maybe for late alfresco dining. There are occasional heat waves, where the average 70-80 degree daytime weather can jump as much as 20 degrees. We arrived during a heat wave in early August, so we timed our outings for the mornings (which were relatively cool) and made sure we were at the caves or on or near the water in the afternoon-- canoeing or swimming (the public river beach has wonderfully clean, fresh, safe water-- water shoes are a good idea since beyond the beach sand are lots of pebbles and stones). But if water activities don't excite you, sitting quietly with food or a book, just enjoying the views from the house or the terrace or a restaurant table, is plenty exciting in its own way. September-- as with any month be prepared for any sort of weather. You'll find early September beginning to cool down from the summer and late September experimenting with the kind of cooler weather that makes bicycling and hiking such a pleasure (although if you are a real bicycling or hiking aficionado, no weather should stop you) . You may get some rain, you'll normally get lots of sunshine, and a light sweater is usually sufficient for most climate eventualities. You may need an extra blanket at night (they are in the bedroom bureau or armoire). October-- a gorgeous month, a bit of quiet descending onto this active region. Mostly sunny and with occasional showers, evenings can be chilly and a cold spell can descend (more likely as you near November), but days for t-shirts are not uncommon. Nevertheless, bring sweaters, a warm jacket, and rain gear just in case. And read up on how to get a good fire going in our grand fireplace. Those ancient house walls provide great insulation, so let in the warmth of the day and close up if the nights get cold. We've stayed at the house in November-- the village starts closing down to hibernate for the winter, many of our neighbors are off to their first or second homes, or their second jobs, and the skies darken early-- it is really quite wonderful. But it takes a brave soul to live by fire alone and in such quiet, so, as with the rest of the winter months, we only rent the house for longer stays-- ideal if you want to work on that novel, or escape humanity's noise. Although summer weather rarely strays above daytime temperatures in the 80s, there have been occasional heat waves in the high 90s or more, less predictable of course with global climate change. But there are solutions (we know, we spent two weeks in a very rare, long heatwave, and we had a great time)! 1) Open the windows when you go to bed (or earlier if the weather drops) and close them up as soon as it starts to get warmer in the morning-- if you are going out early for the day, close them up before you leave. The house retains cold very well if you 'manipulate' it correctly. 2) Indoor things, like visiting the caves or castle or museums or galleries, etc. etc. can be done on the hottest days. 3) Although it can be crowded, the public beach at the river is very refreshing for a dip or swim-- there is often a lifeguard too-- and you can swim out beyond the kids and families and do some laps if you wish. 4) Early mornings are not only beautiful, but generally free of visitors. Have breakfast and play some Boule on the terrace. 5) Similarly evenings are a great time to hang out with drinks and food on the terrace and enjoy the darkening sky-- I think we spent a whole heat-wave week down at the terrace tables, for lunch, dinner, and aperitifs. And don't forget-- a) the water in the bathroom traps evaporates quickly, so if there is even a slight odor, just run water down the drain for 15 seconds, and b) please leave the downstairs humidifier (above the shower) plugged in and running at all times. As changes in climate become more variable, we've tried to make sure the house stays comfortable any time you visit. Sometimes-- most often in early April and late October-- you'll feel a chill in the air. The house is well insulated, but those think ancient walls are better at retaining cold, not heat. Two of the rooms have built in radiators, the rest have portable radiators and/or electric heaters, the bathrooms have towel warmers that also work as radiators, and there are additional heaters on the main floor. Every bedroom has a duvet or two to add to the bedding, although you'll probably want pajamas.The fireplace provides good warmth during a cold spell, but it does take some familiarity with using wood, starting fires, and managing the fireplace flames. The PDF below gives specific instructions on how to use this particular fireplace. We try to keep a supply of wood available on the side of the house, as well as some kindling and firestarter materials next to the fireplace. But sometimes these things run out. Kindling and newspapers can be bought at any hardware store in Cahors. Wood is also usually available. ​Using the Fireplace--Here are some basic instructions (in PDF form) for getting a fire going in the fireplace. It is an unusual fireplace, so please read the instructions carefully. And if you don't have much experience starting fires, follow the instructions step by step. Experienced fire-makers may improvise as desired.